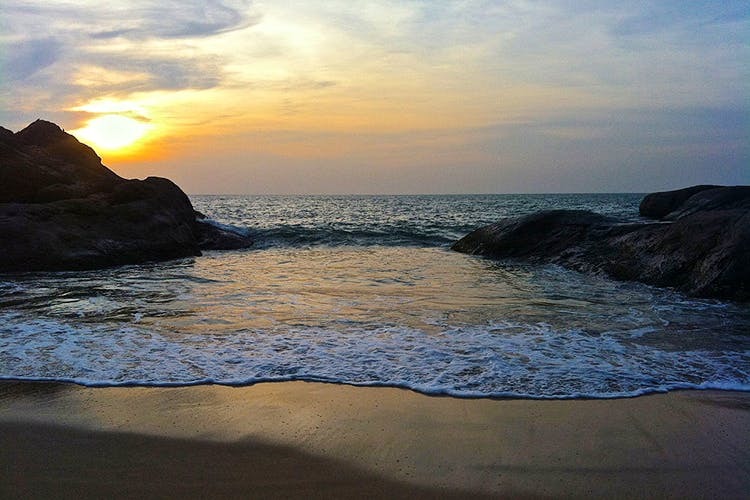 A tiny, seaside town in Udupi district, Kaup is a beach lover’s dream come true. Snorkelling, hidden beaches, and ancient islands can be all be on your itinerary here. Locally known as Kapu, Kaup is a bustling town in Udupi. The town’s main attraction is the main beach (simply known as Kaup Beach) where you can’t get that fashionable swimsuit out but you definitely can go for a spin on a banana boat or on a jet ski. If you are not keen on such heart-stopping action, sign up for a dolphin spotting experience in the mornings. The boats usually go into deep waters and you can wait for the friendly sea creatures to stop by or even float about in the gorgeous waters.Kaup Beach’s shoreline also features a towering, 110-year old lighthouse that’s surrounded by a flurry of basalt rocks. You can scale the lighthouse to catch breathtaking sunsets and gorgeous views of the endless sea. Kaup is a great base from where you can explore many of coastal Karnataka’s best offerings. Just a short drive from Kaup is St. Mary’s Island. Off the coast of Malpe, the historic island can be reached by ferry and you can make around the columns of basaltic lava. St Mary’s is dated back to the time when the Indian subcontinent broke away from Madagascar, eons ago. A quick 40 minute drive will get you to the gorgeous seaside of Kodi Bengre. This hidden beach is where the River Suvarna meets the roaring Arabian sea and is an excellent place to relax and gorge on seafood from a nearby shack. Want to try snorkelling? Head over to the neighbouring town of Murudeshwar around 65 kms away), and you can discover the beauty of the deep, blue sea just off Netrani Island. Kaup is also ideal for surfers with places like the Shaka Surf Club and Ashram Surf Retreat offering lessons.